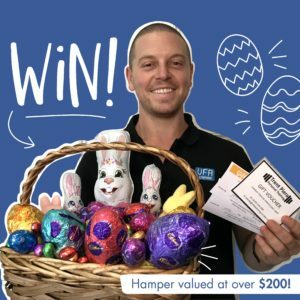 VFA Learning’s ‘Easter Hamper Competition’ open at 3:00pm AEST on Friday April 5th, 2019 and will end at 11:59 pm AEST on Wednesday April 17th, 2019. This competition is only open those within the Geelong and surrounding community who will enjoy all that is included. Total prize pool valued at $200.00 AUD. Including 2x massage voucher for VFA Learning Massage clinic, 1 x Personal Training Session + assorted Easter eggs as pictured. 2. Share the post and tag a friend who you will enjoy the chocolate with. 3. Like our VFA Learning Facebook page. The winner will be contacted by VFA Learning via their Facebook account and acknowledged in the copy of the original Facebook post. The winner will be chosen at random. You can tag and share the post as many times as you like!